Sometimes all it takes is a delicious recipe to spark the hospitality flame. Honey and garlic baked brie will get you out of any party slump you might have fallen into. If you’re in a hosting rut, you’re not alone. Recently I was speaking to a group of women about hospitality. Specifically, we were talking about hosting small, simple gatherings in our homes. When I asked, “do you wish you had people over more often?” every woman in the room raised her hand. Then I asked the question, “so, what keeps you from inviting friends over for a gathering?” On a big flip chart, I scribbled answers as we shared our biggest obstacles. Can you guess what the biggest challenges were to hosting a party? Even a small one? Time was the biggest hindrance. Every woman in the room expressed the desire, in fact it was stronger than desire, women share a deep need to spend time together. But, schedules are filled to the brim and busy lives leave little or no margin for parties. It’s an odd paradox if you think about it… we long to be together, but can’t find the time. We’ve let our calendars become the boss of us. There’s no shortage of fabulous magazine-worthy homes to drool over. But, have you ever noticed what’s missing in the majority of these enviable rooms? People! We are not empty room people, we are living room people. We are Front Yard People. Somewhere in fantasy land I’m sure there are spotless living rooms without dirty socks, Sharpie stained sofas, and broken plastic pieces. I don’t know about you, but I would never turn down an invitation to gather with friends because the hostesses house was a mess, or her kitchen too small. I’d be so happy to be out of my own clutter, I’d actually welcome someone else’s. Sometimes the hardest part about inviting friends over is coming up with something simple to serve. The trick is not to over think it. I’ve spent countless time and energy pouring over cookbooks or Pinterest searching for recipes only to wind up in a perpetual state of analysis paralysis. In reality, having three or four tried & true recipes is all you need. Keep it simple and serve what you know. Whether it comes from your oven or the local food market really doesn’t matter. What do you say? Are you ready to ditch the excuses and make a commitment to gathering with friends? I know I am. Pick a date. Invite a small group of friends or neighbors. Straighten the house, but don’t stress. Better yet, if you have a turquoise table — head out to the front yard. You’ll encourage others who see you enjoying company. A long time ago, I clipped this recipe from the newspaper. Back in the day, it was my go-to appetizer for cocktail parties and festive gatherings. 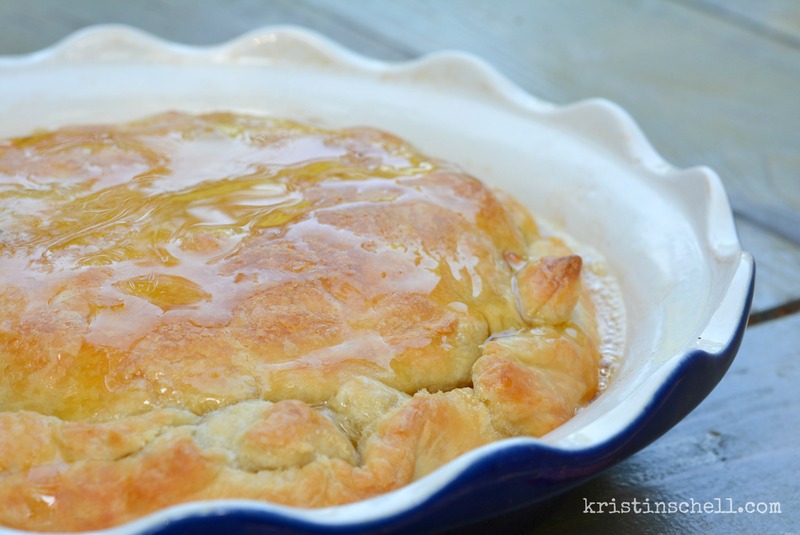 I recently added honey & garlic baked brie back into my rotation of tried & true recipes. File this one under, if you bake it they will come! Lightly grease a 9-inch pie or tart pan. Drape one of the pastry sheets over the pie pan allowing the edges to hang over the edges. Place the brie on top of the puff pastry in the center of the pan. In a small saute pan, heat the butter and garlic over low heat until melted and fragrant. Do not brown the garlic. Pour the melted garlic butter on top of the brie. Fold up the edges of the pastry so they cover the brie. The edges of the brie and pastry will not touch the sides of the pie pan, but will expand when cooked. Drape the second puff pastry sheet over the brie and tuck it’s corners around the brie and round shape of the pie pan. Bake for 25-30 minutes, until pastry is golden. Transfer to a serving platter and drizzle with honey. Here’s to gathering with friends! Are you supposed to remove (peal) the rind from the brie, or do you bake it with that on there? Leave the rind on! It gets soft and tastes delicious!